do not use this product if you have a history of allergy to local anesthetics such as procaine, butacaine, benzocaine or other "caine" anesthetics. - for more than 7 days unless told to do so by a dentist or doctor. - Should be supervised in the sue of this product. - Ask a dentist or doctor. - Do not use if tube tip is cut prior to opening. - This preparation is intended for use in cases of toothache, only as a temporary expedient until a dentist can be consulted. Do not use continuously. 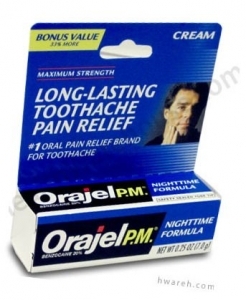 - Orajel P.M. will stay in place for extended duration of relief.